Poverty Solutions released its 2018 Impact Report earlier this week. The report chronicles the Presidential Initiative’s successes over the past year, including a deepening partnership with the City of Detroit. 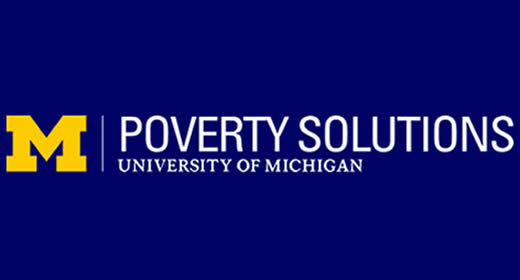 Housed at the Ford School, Poverty Solutions researches, tests, and gathers feedback on policy changes aimed at addressing key sources and stressors of poverty. It was established in 2016 by University President Mark Schlissel and utilizes a multi-departmental approach to problem solving with a Dean’s Governing Board, including Ford School Dean Michael Barr, helping to oversee the venture. Attracting more than $8 million in external funding since its 2016 founding for important projects happening across the university. Providing policy insights on student homelessness and early childhood education for the state of Michigan. Launching a new partnership with Harvard University on economic mobility data analysis. Growing opportunities for student engagement, including a new speaker series course. The report details the strides being made through the Partnership on Economic Mobility between Poverty Solutions and the City of Detroit’s Mayor’s office. Staff members are embedded at City Hall and in the community, and faculty from across U-M’s campus are working to bolster economic mobility and reduce poverty citywide through a focus on jobs, housing, and education. Luke Shaefer, Ford professor and Director of Poverty Solutions, has been there first-hand throughout the development. “Poverty Solutions has come a long way since it was formally announced in fall 2016,” Shaefer wrote in his letter that prefaced the Impact Report. Addressing the future of the initiative, Shaefer wrote “we seek to address concrete challenges faced by disadvantaged families across systems such as housing, transportation, employment, and health. Read the full report here, as well as The Record’s coverage here. Poverty Solutions combines the assets of the university toward the prevention and alleviation of poverty. This work can affect the lives of millions of Americans through partnerships with community groups and policy makers to test the most promising solutions possible.